Zimboinlimbo: Backstage are putting on Doubt this week HURRRRY!! Backstage are putting on Doubt this week HURRRRY!! I have been hounding the Backstage peeps to send me the blurb on their upcoming production "Doubt" so that I can share the info. The show starts on the 18th September so get your tickets sooner rather than later. If you have ever had a niggling feeling of doubt about something or someone, well this is the show for you. With a stellar cast and crew this is bound to be a sure fire winner with Dubai Audiences. Get in on the act and get down to the Theatre. Backstage is back with its season opener ‘Doubt- a Parable’. This Pulitzer Prize- and Tony-winning drama is all set to take the stage this weekend at Duactac, Mall of the Emirates on the 18th & 19th September at 7:30pm and the 20th at 2:30 & 7:30pm. Set in a school in the Bronx, it centers on a nun who grows suspicious when a priest begins taking too much interest in the life of a student. Focusing on themes like antagonist against protagonist, a person’s internal struggle and standing up for what is right, the play refreshingly brings back the basic concept of right against wrong seen previously in dramas like Reginald Rose’s ‘12 Angry Men’. Life is made up of the choices that we make. Every choice we make has a domino effect. ‘Doubt’ is what is created in Sister Aloysius’s mind when she decides to follow her intuition. This play, with conflicting viewpoints, written with a perfect mix of determination and detachment, by John Patrick Shanley is being directed by Brent Jenkins. 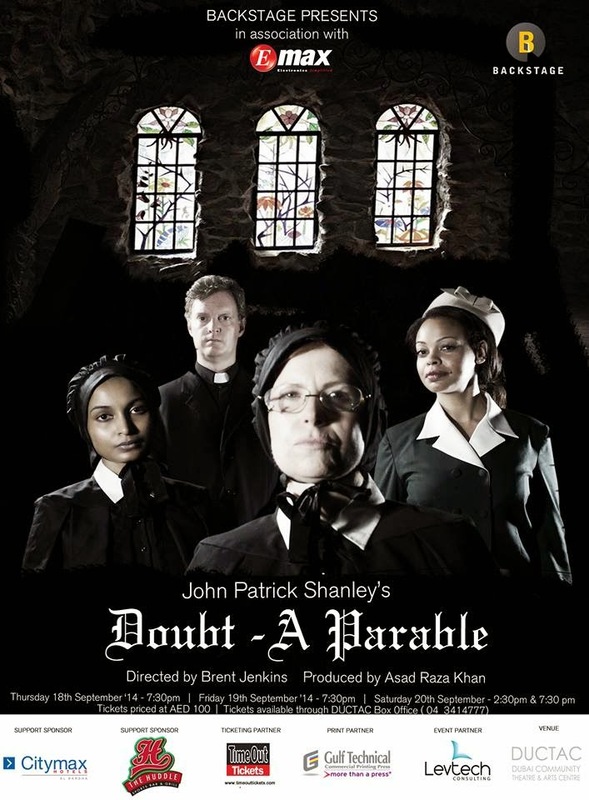 With Mike Green as ‘Father Flynn’, Celia Cookson as ‘Sister Aloysius’, Ramya Bala as ‘Sister James’ and Mylene Gomera as ‘Mrs. Muller’ this promises to be an unforgettable performance. Book your tickets now at timeout Dubai (www.timeouttickets.com) or for ticket reservations, please call the DUCTAC box office on 04-3414777.